The Communion Veil: Demons Don't Carry Identity Cards. 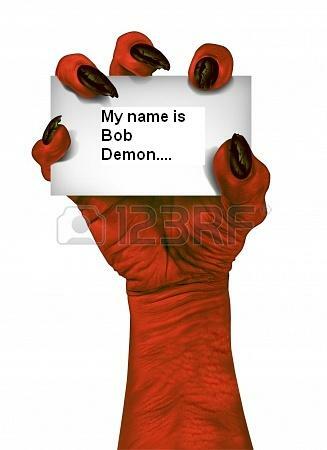 Demons Don't Carry Identity Cards. The 'spirit' took on attributes of a person's mother that had recently passed. The 'spirit' even knew the Mother and Daughter's 'secret' word that they had chosen in advance of the Mother's passing. Well that must be proof that was the Mother, right? NO. Let me explain. Demons are constantly around us trying to trip us up so that we lose our salvation, they will DO ANYTHING, let me repeat: ANYTHING including taking on the shape, voice, smell, and even provide secret code words in order that you will seek the paranormal (their playing field) and as a result putting you at risk of losing your salvation. How did the 'spirit' know the code word? Simple, the demon assigned to the Mother or Daughter was present when they decided on the secret word. How better to get them entangled in the supernatural and keep them there with seances, etc than to provide such 'evidence'. We cannot forget their whole purpose is to keep you away from God and His truth, what better way than to keep people seeking after what is not of God. 1. Demons ~ These are demons pretending to be your loved one to keep you distracted and turned away from God. (Think about a baby and a rattle or a shiny object, kind of the same thing). Ever heard of 'shadow people'? Darkness is of the demon. 2. Demonized Humans ~ humans that have been condemned to hell but have taken the goals of the devil and seek ruin of souls on the earth, even their own family members. That last one is hard to hear, but a condemned soul hates God, and their is no love in Hell. They hate even those they have left on the Earth and will seek their destruction also. I beg you, don't watch these shows, or do anything they do because you may literally be playing with hellfire. 2. Pray that if they are a soul in purgatory that God be merciful to them. NEVER ENGAGE THEM, do NOT look them in the eye, speak to them or ACKNOWLEDGE THEM in any way. When the demon fell like lightning from heaven the communication between God and Lucifer CEASED. We should not speak to the one that chose to be God's enemy. Amen! They look like your average person, then the mask comes off!